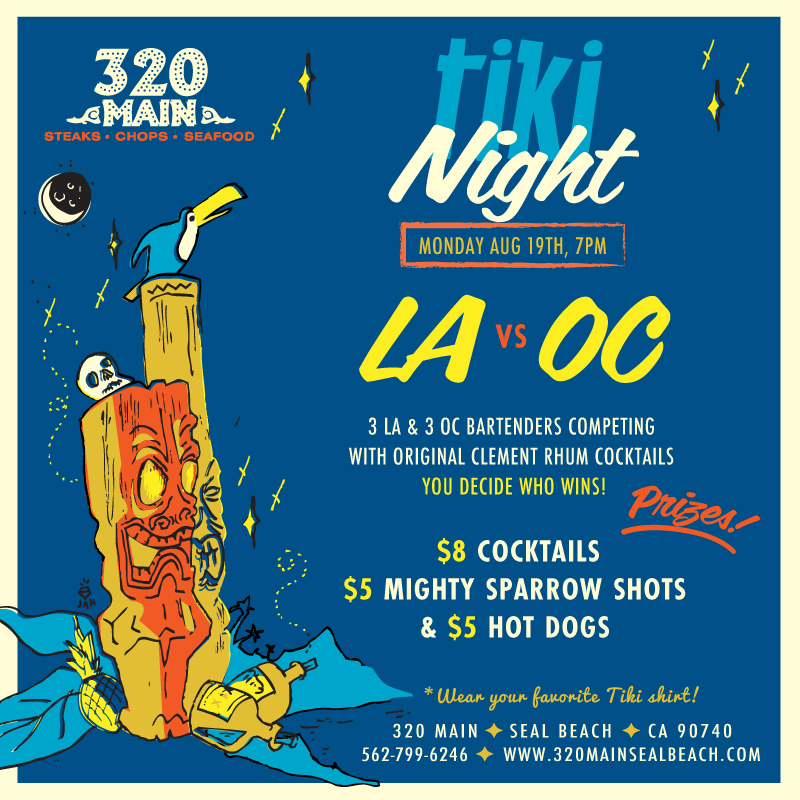 A Southern California cocktail tradition returns on Monday, August 19, when 320 Main presents Tiki Night: LA vs. OC Throwdown. What began as a monthly series in 2011 became a one-off event last year with the Tiki Throwdown, which pitted five tiki icons against each other in a contest decided by popular vote. The format was first used with great success at the excellent Don vs. Vic night from the 2011 series. Like its predecessors, the LA vs. OC Throwdown promises to be a tiki battle of epic proportions, featuring a stellar lineup of bartenders from some of the best bars in Los Angeles and Orange County. Representing Los Angeles: Danielle Crouch of Caña Rum Bar, Edwin Cruz of The Spare Room, and Joseph Swifka of La Descarga. And from the home team: Gabrielle Dion of Broadway by Amar Santana, Kelly Merrell of Trader Sam’s Enchanted Tiki Bar, and 320 Main’s own Matt Robold aka Rumdood. Guests will choose the winning team by voting for their favorite drinks. Everyone who casts a vote has a chance to win one of the awesome raffle prizes, like yours truly did last year – an autographed copy of Beachbum Berry Remixed. The original Rhum Clément tiki drinks from the guest bartenders will be $8 each, along with $5 Mighty Sparrow shots. 320 Main will also serve $5 hot dogs to help guests soak up the tropical libations. As he’s done before, DJ Ken Caldretti will be setting the mood, and guests are encouraged to don their finest tiki attire.